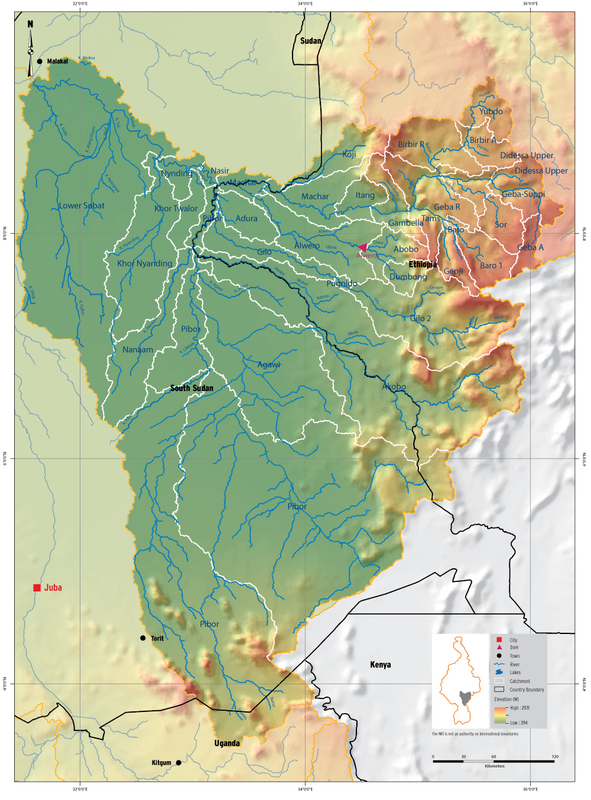 The Baro-Akobo-Sobat River includes the discharge from two tributaries: the Baro River from the Ethiopian Highlands and the Pibor River from southern Sudan and northern Uganda. Most of the runoff develops in the mountains and foothills of Ethiopia. Portions of the Baro flow spill through a series of channels to large wetlands known as the Machar Marshes. Pibor drains a wide area of plains, but only contributes significantly in times of high rainfall. The highest rainfall is over the Baro basin in the east of the sub-basin where the average annual precipitation almost reaches 2,000mm. The lowest is over the southeast over a tributary of the Pibor River with an annual precipitation only slightly over 300mm. The average annual precipitation over the entire sub-basin amounts to 1,338 mm and the average annual potential evapotranspiration is 1,592 mm.